For most of Indian history before Mohammed Ghori’s invasion in 1192 AD, Delhi didn’t really figure as a significant city on India’s map. 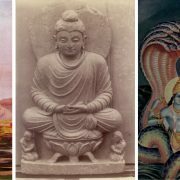 (Some may point out to the theory of Delhi having the site of Mahabharata’s Indraprastha – but that is uncertain, and even that was never the capital of a vast empire like that of the Mauryas or the Guptas). Other cities such as Patliputra, Ujjain, Kannauj and Mathura had been the major seats of power in north India. 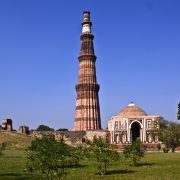 Delhi attained some importance under the Tomar Rajputs from around 1050 AD (they built Lal Kot and later Prithviraj Chauhan built Qila Rai Pithora). But it had never been a place from where the entire subcontinent’s fate would be decided. That started to change after Ghori. Delhi was adopted as the formal capital of the new rulers. And under powerful later rulers like Alauddin Khalji, Delhi’s influence reached deep into South India. 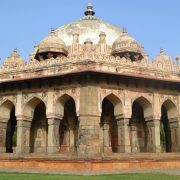 Since then, Delhi has always been the most important city in India (barring a couple of centuries in between, when Agra – under the Mughals; and then Calcutta – under the British, held that honour). 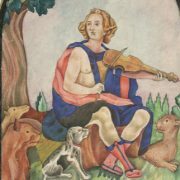 What made this city, which was an obscure hamlet for close to three thousand years, such an enduring choice for the capital of this vast country? Like most things involving real estate, the answer is: location, location, location. It’s useful to see Delhi’s position vis-à-vis India. India is geographically bounded on three sides – the Himalayas on the north and north-east, and the seas to the east, south and west. The main entry point, historically, has been through the Khyber Pass in the north-west – on descending from which you encounter the Indus river, which gave India its name. North India has three major geographical features – the Indus river system with its five major rivers – forming the Punjab; the Gangetic river system that flows in India’s heartland; and the Thar desert which kind of divides these two major river systems. 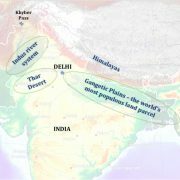 The Gangetic plains are a fascinating piece of world geography. Nourished by a tropical climate and by rivers fed by the melting snows of the Himalayas, these plains are an agricultural paradise. And where you have agriculture, you have the capacity to support people – who can grow food and pay taxes. In fact it is so conducive to human settlement that the area of the Gangetic plain (comprising the five Indian states of Delhi, UP, Bihar, Haryana, and West Bengal; and the country of Bangladesh) accounts for a current population of 605 million. That is almost 9% of world population, for a piece of land that is less than 0.5% of the world’s area! 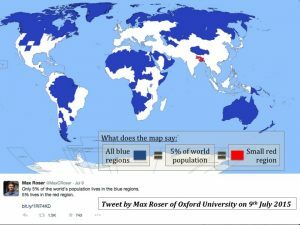 There’s an interesting graphic tweeted by an Oxford researcher, comparing the population density of this part of the world with a few other regions. So the Indo-Gangetic plain, with a density of almost 900 people/square kilometre (as against the world average of around 50) is not just another crowded place – it is the world’s most populous piece of real estate. Basically, a great target if you wish to start a land-revenue-funded medieval empire. And guess which place is ideally located to control this crucial piece of real estate – you’re right, it’s Delhi. Delhi is located at the western end of this river system, on the banks of the Yamuna, a major tributary of the Ganga. 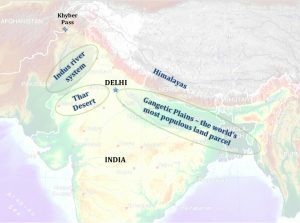 With the Thar desert forming a natural barrier to its west, Delhi is a great location to control the Indo-Gangetic plain. But hang on, they could’ve chosen any site that was situated on the bank of the Yamuna – why specifically this one? 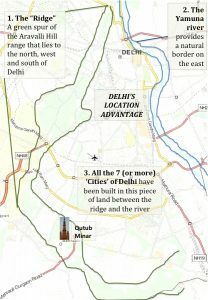 If you look at the relief map of Delhi, you will see the reason for the site location – the Ridge and the River. The Ridge is a northern extension of the ancient Aravalli mountain range. These hills form a broad ‘C-shaped’ barrier on the west – with the Yamuna river acting as a natural border on the east. Almost all of the early development of the city took place in the zone lying between the ridge and the river, given the natural protection on all sides. So let’s recap – for control over India, it’s important to have control over India’s most populous region. And the location of Delhi is ideal for doing so. And that’s how Delhi attained its status as India’s pre-eminent city and has pretty much retained it ever since. 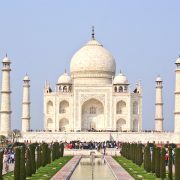 Did Shah Jahan Read 'Good to Great'? Whats the big deal with this symbol? 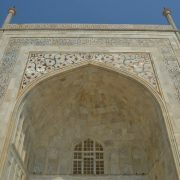 William Dalrymple Did Shah Jahan Read ‘Good to Great’?